Exterior Painting Service is a great way to improve the curb appeal of your home quickly and in a very dramatic way. You might not even have to paint your home, maybe it’s a shop, a garage, a fence or an outbuilding. Maybe you just want the exterior trim such as fascia and window trim painted. Not only does a fresh coat of Exterior Paint keep your building looking great but it also serves as a barrier of protection against the elements. Sun, Wind, Rain and Freezing weather all take it’s toll on your exterior painting services job. Over time the exterior painting will start to fade, flake and peel off. When this happens you leave the building materials exposed to the elements and this is just asking for trouble. 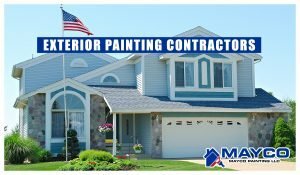 Mayco Painting, LLC is a full service exterior painting service contractor in Beaverton, Oregon. Our experienced exterior painting contractors specialize in residential exterior painting service projects such as houses, shops, garage doors, trim and we even offer deck restoration services as well. While we can’t paint your building and tell you it will last forever, we can certainly tell you that a Mayco Painting LLC completed exterior painting service job will look much better and last much longer than most. Do we use any special paints? No, Not really… But we are very meticulous with every detail of your painting project, especially the planning and prep work, which is what really makes a quality paint job last a long time. Portland Oregon and surrounding area offers it’s own challenges for the exterior of your home or building due to our often cold, wet climate so it’s important that great care be taken to make sure all surfaces are completely dry and free of contaminants before applying any paint. 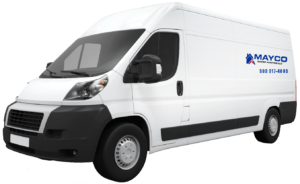 We take great care in preparing what needs to be painted because we know if we didn’t that you’d be calling us back to repair it. Some painters don’t mind, because they ignore the phone call. Another aspect of painting the exterior of your home or any building or feature is taking very accurate surface area measurements so you don’t end up wasting paint or storing several cans in the garage. Mayco Painting LLC will accurately estimate the paint coverage of your project and we won’t have any wasted paint, save a small sample in case you need to have more matched.